Sitting horseback atop a hill overlooking the Cracow ghetto, Oscar Schindler watches the Nazis mass-murder Jews when, amongst the massive atrocities, a little girl in a red coat catches his attention. Schindler watches as the little girl walks aimlessly about, passing no less than seven pointblank shootings before slipping unnoticed into a building. As gunfire continues to echo throughout, she is but one amongst hundreds in the scene, yet her specificity humanizes the otherwise countless atrocities Schindler witnesses. If I told you about a little girl in a village in Africa who is going to die from a disease in the next few months, you would find the story upsetting. If we could measure your level of upset as, let’s say 10 units of upset, then if I told you the same story, but this time it was about two little girls who would die from this disease, wouldn’t you expect that your level of upset would be twice as much, or 20 upset units? The sad truth is that it would actually be the opposite – meaning less than 10. And it would be even lower if it’s five girls — even less if it’s one hundred girls, and eventually hardly at all if it’s a million little girls. Kristof cites the famous quote from Mother Teresa that parallels this — "If I look at the mass, I will never act. If I look at the one, I will." And along the same line he points to the old adage: One death is a tragedy, a million deaths is a statistic. Olson, Randy; Barton, Dorie; Palermo, Brian (2013-09-18). Connection: Hollywood Storytelling meets Critical Thinking (pp. 76-77). Kindle Edition. Oscar Schindler and the little girl in red represent a literal embodiment of Mother Teresa's quote. Had Schindler not seen and followed her plight and witnessed her eventual outcome, he would have only seen the death on a massive scale and never acted upon it. The little girl in red was a human being, a face amongst a mass of casualties. Because Schindler is the story's main character and the little girl's significance to the story paramount to both its meaning and structure, she's colorized to stand out amongst the black and white to provide a more subjective viewpoint. Subjective gravitas is further given by intercutting Schindler's bewildered reaction as he continues to follow her amongst the chaos. As discussed in a previous article, this technique is what neuroscientists call "mirroring." This enables a person, in this particular case "the audience," to experience the emotions of another vicariously. We know what Schindler's looking at specifically and understand his feelings as a result. The scene also operates as a set-up with an inevitable payoff. When Schindler once again sees the little girl in red, her body is carted amongst other, "anonymous" victims to be incinerated in mass burning pits. While many victims are unidentifiable at this point, her colorization once again stands in stark contrast to the black and white signifying "the one amongst the mass." Schindler once again watches her pass, his hand holding a handkerchief slowly falling from covering his nose and mouth as the emotional weight of bearing witness to her lifeless body now renders the stench of the dead less horrifying in comparison. It's at this very point that Schindler changes completely toward saving as many Jews as he can at any and all costs. 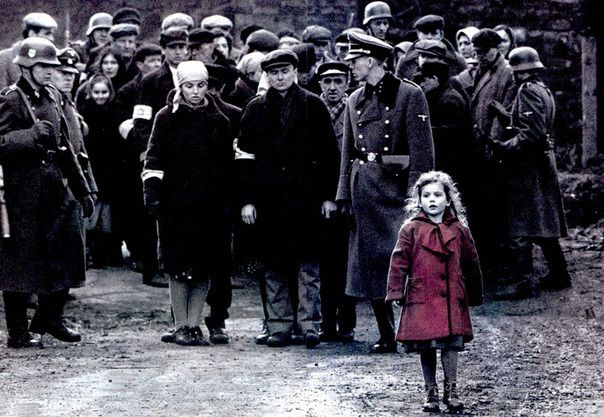 While Schindler's List does not focus its story on the plight of the little girl in red - her two scenes comprise mere minutes of run-time - her inclusion and subsequent audience fascination indicate an understanding, at least from a subconscious point, of her thematic significance. The notion of "one" comes up again when Schindler asks of Commander Goeth, "All you have to do is tell me what it's worth to you. What's a person worth?" to which Goeth refutes "No no no no. What's one worth to you?" The same thematic thread resonates at the end of the film, "Whoever saves one life saves the world entire." The power of the one ultimately works twofold in Schindler's List; the little girl in red becomes the singular driver of change for Schindler who, in turn, becomes the epitome of what one person alone can do when they take action.